Silhouette of a Tree by Ingrid Kast Fuller at the Second Annual Kerrville Chalk Festival 2016. October 15th and 16th, 2016, artist and web designer, Ingrid Kast Fuller, participated in the Second Annual Kerrville Chalk Festival. 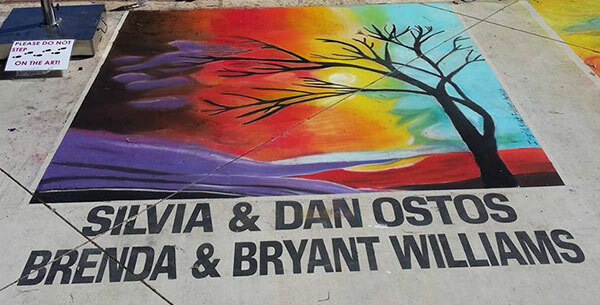 The sponsors of the 6´ by 6´ square were Sylvia & Dan Ostos and Brenda & Bryant Williams. Katie Phillips was the artist's assistant. The Second Annual Kerrville Chalk Festival was full of talented artwork, music, food and fun for the whole family. 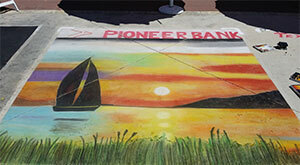 Visit the Kerrville Chalk Festival Facebook Page. Artist and web designer Ingrid Kast Fuller recently participated in the First Annual Kerrville Chalk Festival, June 6 & 7th, 2015, which drew over 6000 attendees in Kerrville, Texas. The sponsor of the square was Pioneer Bank. One of our charities we have supported in the past is The Houston Via Colori Street Painting Festival. The Houston Via Colori Festival is a fundraising event for the Center for Hearing and Speech which helps children that are hearing or speech impaired. The festival is held in Downtown Houston near Sam Houston Park.. Here's a map and directions to Houston Via Colori. 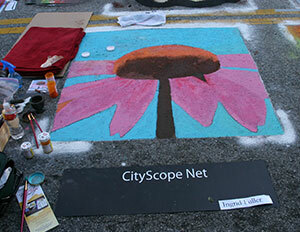 CityScope Net sponsored a square at the Houston Via Colori Street Painting Festival in 2010 and 2011. Artist Ingrid Kast Fuller created the 4' x 4' Cone Flower by painting the chalk with a brush using a Jamie Oliver mortar and pestle crushing the chalk and mixing with water like paint. At the Via Colori Street Painting Festival in 2011, Ingrid chose to draw a Paino Man inspired by musician Billy Joel's song "Piano Man". She used both the wet paint and by hand methods. 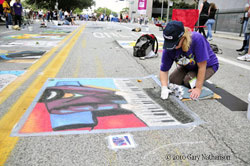 The Houston Via Colori Street Painting Festival is held annually every November, the weekend before Thanksgiving. 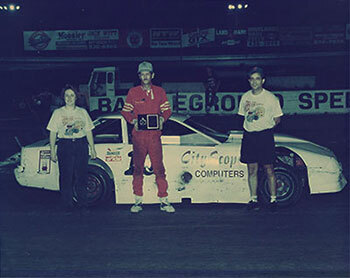 Back in the mid 1990's, CityScope Computers sponsored a racing car driven by Dennis, one of our employees. Dennis was the top scoring racer in points for the year at Battleground Raceway, Baytown, Texas.